Help! I installed R# 6.0 on Windows 7 Enterprise x64 system with VS2008 and VS2010. 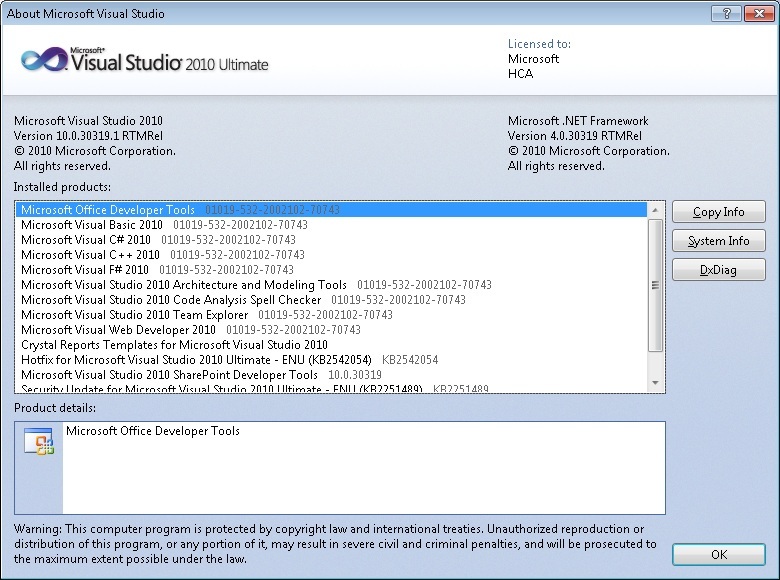 VS2008 integration works, but VS2010 does not -- but no errors. There is a 'JetBrains\ReSharper' folder under C:\Program Files (x86)\Microsoft Visual Studio 10.0\Common7\IDE\Extensions and the icons in that folder point to the corresponding files in ReSharper installation folder (C:\Program Files (x86)\JetBrains\ReSharper\v6.0\Bin). Could you please attach a screenshot of Help | About Visual Studio window? Do you have any other extensions installed? Do they work fine? Extension Manager indicates that NuGet Package Manager is installed, which probably comes with VS2010. For more information, visit http://support.microsoft.com/kb/2251489. For more information, visit http://support.microsoft.com/kb/2483190. this behavior. Could you please attach the full Visual Studio startup log? and check if it integrates fine? Thank you! which probably comes with VS2010. Good news! I installed dotCover (1.1.312.11, from the EAP site), and now ReSharper works (and dotCover shows up too). Thanks for your help. This was very frustrating. We'll see if others have this problem on our Windows 7 PCs.